Bear Cubs in an Enclosure One of the facility’s natural climbing structures, and some of the conspecific interactions that took place in the pens. New research reveals that orphaned cubs will likely avoid humans if properly rehabilitated. Sadly each year, there are orphaned bear cubs in Utah. Some lose their mothers to forest fires, while others are orphaned by vehicle-bear collisions or other human-related conflicts. 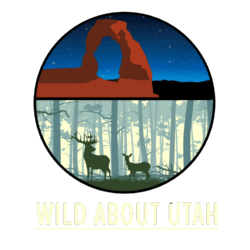 If the orphaned cubs are too young to survive on their own and the Utah Division of Wildlife Resources (DWR) finds them before they perish they can be rehabilitated and have a good chance of surviving. With the help of USU’s Dr. Julie Young a U.S. Department of Agriculture wildlife biologist and associate professor in the Quinney College of Natural Resources, who has expertise in managing carnivores in captivity, DWR was able to help build appropriate enclosures for the rehabilitation of the cubs. 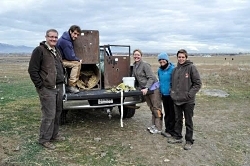 Young helped built these temporary homes at the USDA National Wildlife Research Center’s Predator Research Facility in Millville, Utah. 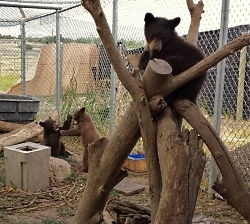 To ensure the enclosures met the basic needs of cubs the researchers contacted approximately a dozen rehab facilities around the US and Canada to find out “HOW” to rehab bears. Interestingly, there were large differences in responses. According to Young, “A few consistent traits did emerge. Bears get easily bored, they like to play and investigate everything. So, we made sure the pens had lots of enrichment items and activities and everything was extremely sturdy since bears are very strong even as babies! “Because they were being released back into the wild, we wanted to do as much as we could to give them natural surroundings – like logs, twigs, etc. One fun thing about bears – is they love water! The cubs spent a lot of time in their huge tubs or playing in the water fountain meant for drinking. Myers began his work in the summer of 2014 when DWR brought six orphaned cubs to the Millville bear rehabilitation site. Throughout the rehabilitation, there was very little human contact to ensure the bears did not become familiar with humans. This was tough since cubs are cute and people wanted to see them. However, they remained firm and did not allow visiting hours. They removed as many human sights, sounds and odors as possible by keeping noise to a minimum, and since bears have extremely good noses they eliminated as many human smells as possible no perfumes or scented lotions were allowed. At feeding time they fed the cubs from behind a blind, or put them in one pen while they cleaned and left food in the other. The researchers never went in the same pen as the cubs. Loading two immobilized and recently collared cubs into their enclosures for transport to their release locations. Myer’s research was unique. In addition to the regular food and development regiments, the cubs went through numerous behavioral tests to determine if they were bold, shy or somewhere in between when introduced to novel stimulus. Consistent test results were the key in determining what type of animal personalities the cubs had. One test included placing the cubs in a new enclosure with the same layout as their previous one. The shy cubs responded by hugging the walls and cautiously moving around while the bold cubs began exploring immediately with little signs of fear. 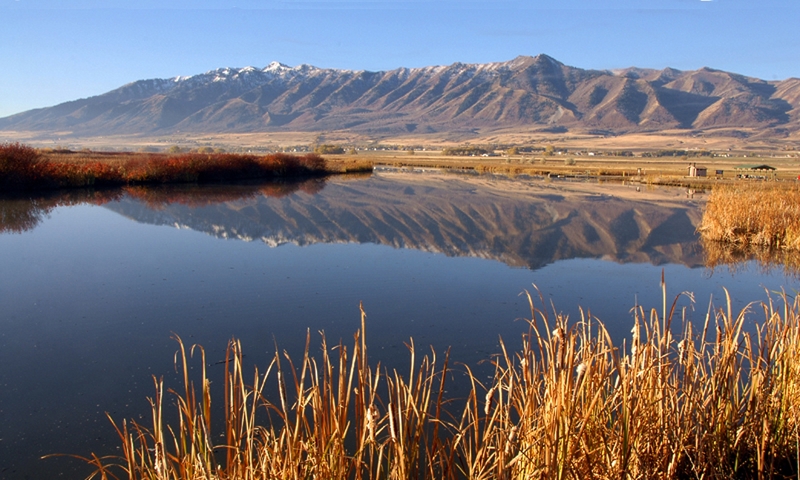 Once Myers classified the bears, and the cubs were old enough, the research team released the young bears to remote locations throughout Utah. 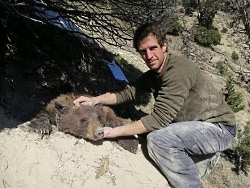 Patrick Myers has immobilized and extracted one of the bears from her den in early spring of 2016 to assess her health and the fit of her collar; this was in the Lake Canyon area, southwest of Duchesne. Myers monitored the bears throughout 2015 until they emerged from their dens in the spring of 2016. “The bears were fitted with expandable GPS collars so they would grow when the cubs did and so Myers could watch their movement from a computer. Myers went to check out dens once they left them, to be sure their habitat choices were appropriate based on bear biology. Myers and Young were pleased to see that even though the cubs had been in close proximity to the smell of humans for many months; neither the bold nor the shy bears sought humans once they released them. They all had healthy responses to their natural habitat and behaved much like young bears not orphaned. They searched for dens almost immediately, and remained in the remote locations. Although this is a small study, the initial results show that orphaned cubs, whether shy or bold, will likely avoid humans and retain their natural instincts if property rehabilitated. This may be a useful management practice for restoring bears where populations are dwindling and habitat is ideal.